Shaquille Coulthirst poses for his first Posh photo. Photo: Joe Dent/theposh.com. Peterborough United have signed young Spurs striker Shaq Coulthirst for an undisclosed fee. It’s a third signing in under 20 hours for Posh, following the sale of top scorer Conor Washington to QPR for £2.5 million on Tuesday (January 19). Left-back Harry Toffolo (on loan from Norwich) and midfielder/striker Adil Nabi (permanent from West Brom) moved to Posh yesterday (January 21). Coulthirst (21) is an Academy graduate of White Hart Lane, but didn’t make an appearance for the first team. His Football League experience is restricted to loan spells at Wigan, York, Southend and Leyton Orient. Coulthirst has signed a three-and-a-half year deal. Posh fough off late competition from a rival League One club to capture an England Under 19 international. Coulthirst said: “The manager really demonstrated that he wanted me to sign for the football club and as a player if you feel wanted then it makes the decision easier. Peterborough are a good side, they score lots of goals and I cannot wait to get started. 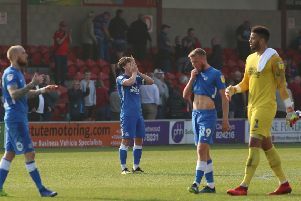 Posh boss Graham Westley added: “I first saw Shaq when he was on-loan at Southend United and he played in a wide left role, but he had played a lot of his football at Tottenham as a number nine. I used to watch him every week when I was at Stevenage as Tottenham under 21s play their fixtures there and he had phenomenal pace off the shoulder, a great ability to get in behind and an eye for goal. “He was always a player that you felt was very dangerous. He had the potential as a lone striker to get in behind and cause havoc. When at Southend, he played wide and didn’t get as many goals as you would expect because of that. I was always glad he was playing wide when we played against them.